with Mozilla’s Firefox Web browser. This is connected to Microsoft’s .NET Framework. The Framework is basically ‘stuff that allows you to run other stuff’ and Internet Explorer has a big security hole whereby users can inadvertently run code that would compromise their computers to malware. 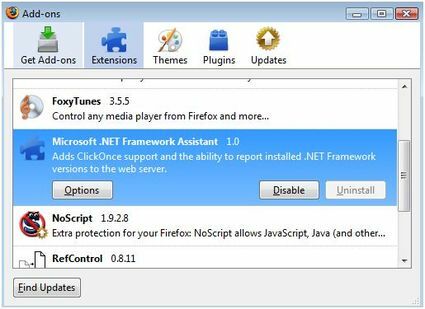 Now, Microsoft has added the same security hole to Firefox with a new plugin. And they don’t ask you before they install it. And they enable it automatically. And they don’t allow you to remove it. The Uninstall button is greyed out! And if you do try and remove it you might break your machine. So even you use Firefox on your Windows machine because you know Internet Explorer has a worse record on security – it doesn’t matter. They are going to shoehorn the same vulnerabilities IE has into Firefox without asking you – and not letting you uninstall it. Whenever I encounter something so wrong-headed done by presumably smart people you have to assume that they must really hate their users. I know a suit was behind this decision to increase .NET Framework’s reach or whatever but it is completely anti-user. This entry was posted in General on May 30, 2009 by Andy Wibbels.